THE DRUM IS A GATEWAY TO RHYTHM.. . . .
Our first exposure to rhythm is before birth, when we are one with our mothers heart beat for nine months. Through the primal medicine of the drum we enter back into the present moment in a natural, joyful way, no matter how inexperienced one may be. 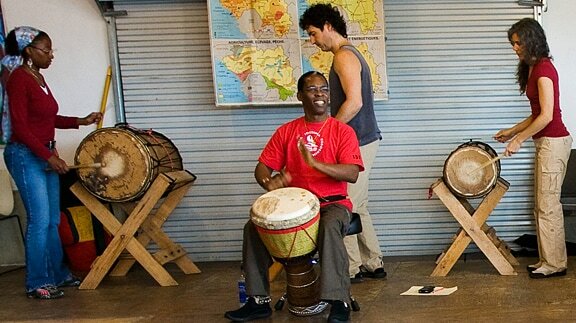 Being part of a drumming ensemble creates a sense of connectedness with oneself and others, without the need for verbal language. 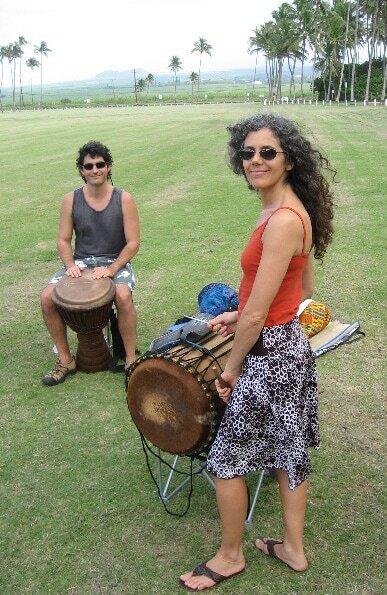 ​Come and learn traditional Malinke African rhythms. The many interwoven patterns that combine in a traditional African rhythm allow us to experience a harmony within and music without. It requires each participant to tune in, listen and become part of an entire ensemble of players! We have been teaching weekly classes on the island of Maui, Hawaii since 2003. We are devoted students of world renowned Grand Master Djembefola, Mamady Keita, who we have had the privilege of studying intensively with over the past decade. Aside from performing at local events, weddings and fund raisers, in 2010 we were invited to teach at the Summer Youth programs for the mainland Waldorf Schools. 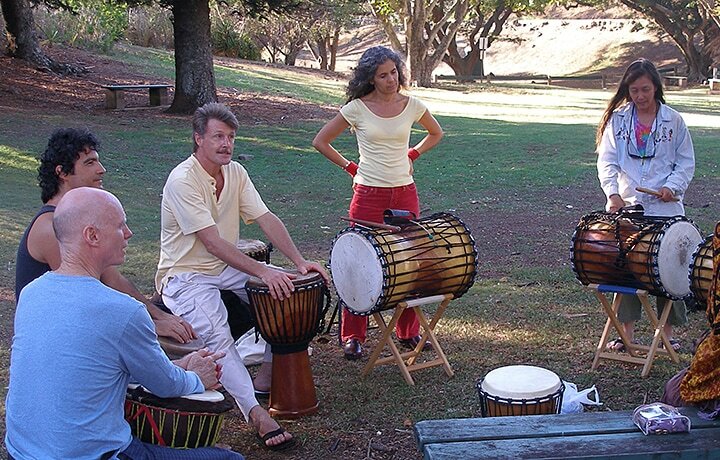 In 2009 we drummed for Internationally renowned leader for Women's empowerment, Sierra Bender's "Bootcamp for Goddesses". In 2008 we were invited to teach at "WildQuest" a Dolphin Retreat Center on the island of Bimini in the Bahama's. We endeavor to create a playful atmosphere for all to feel welcomed and to have fun exploring the joy of rhythm". MauiDrumming.com is available for teaching corporate groups, schools, community classes & performing at public & social events. 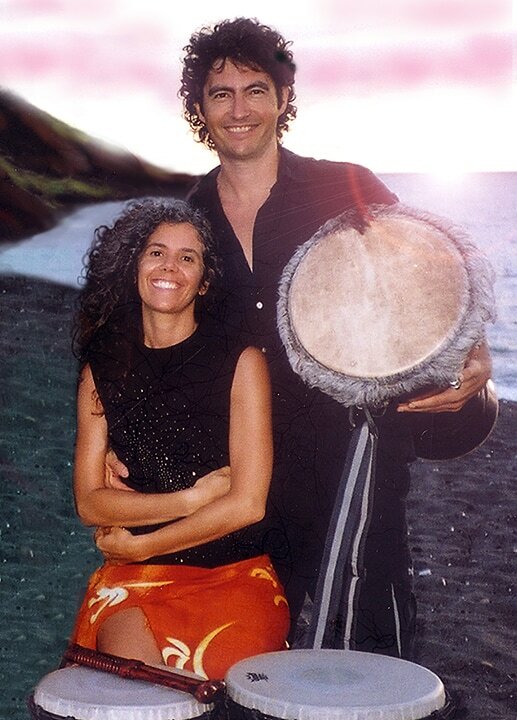 "Steve and Mayra's deep love and enthusiasm for drumming was brought to Kahua-Haiku's adolescents and adults summer youth leadership program, on Maui Hawaii. They are articulate, warm and masterful at their ability to weave together a group. They take each person through a process that together creates a harmonious whole. It was a truly transformative experience. After each session the students went away joyous, grounded and filled with light." - Maureen Curran Owner/ Director Kahua Haiku. Teacher, Movement specialist. "We love to create a playful, safe environment where everyone feels at ease no matter what skill level they are.....ego's are to be left at the door. The medicine of the drum is accessible at every level. Our philosophy is that if you truly enjoy what you are engaged in, the easier it is to learn......your motivation will be the sheer joy of immersing oneself into the magic of rhythm! "